As the White Lions told me when we met in the spring of 2013, if we do not preserve the apex guardian species, our ecosystems and life as we know it will be thrown into chaos. Today in South Africa there are animalcide camps called “canned camps” where White Lions are systematically raised and then shot to death for a price. The murdered lion’s skin and head bring as much as $65,000 to $120,000 in the marketplace, but the cost to our souls is bankruptcy. Overall, the lion trophy business in Africa is valued at 91 million dollars a year. Journalist Roger Cook went undercover posing as a hunter, with the intention to film a “canned lion” hunt. Before pulling the trigger he revealed to the people involved who he was and what he was doing. A scuffle ensued but luckily the tv crew and the team managed to get away unscathed. The piece was later aired and footage emerged that was secretly filmed on another farm of a lioness being shot from a vehicle next to a fence whilst her cubs watched from the other side, isolated from getting to her. This naturally caused an uproar and upset even the most hardened non animal lover. It was dubbed a “National Disgrace” and government was implored to do something. Unfortunately, these death camps continue today and are often part of a lucrative tourist-driven cub-petting industry as well. Young lion cubs, captured from the wild or bred in captivity, are handled and walked by humans until it is no longer safe to do so. Then these same little furry, beautiful, petable lions become the captive victims for the next generation of “kill for fee” industry racketeers. Today, even with public awareness increasing about these horrible realities, White Lions are not afforded any legal protection—nor are any of the other 20,000–30,000 remaining lions in Africa. If not imprisoned and later shot for a price, many are stolen and placed in zoos and circuses around the world. In fact, there are supposedly only thirteen free White Lions living in their indigenous heartland of Timbavati today. All the others are in captivity or being guarded in private sanctuaries. 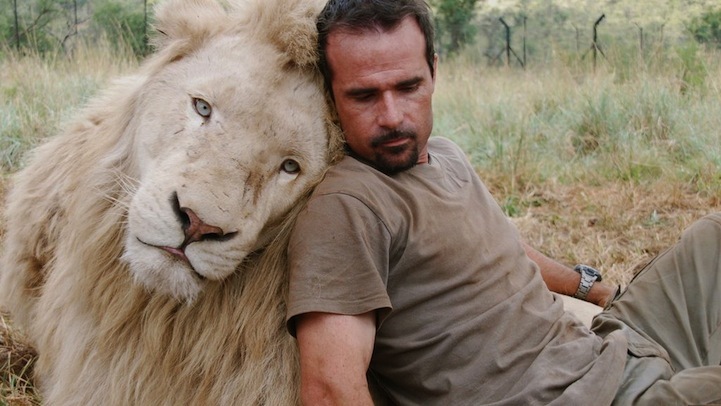 So conscious are these majestic animals, as Richardson shares in films about his life and conservation efforts, one can come into gentle rapport with the great king of the beasts. He, like Charlie Russell and other wildlife “whisperers,” makes clear that established relations with these sentient animal beings are nurtured over long periods of time. As Richardson explains, many of the lions he works with in his films, and has saved, he has known since their births. As mentioned earlier, it is not by brutalizing or overpowering animals that we can enter into peaceful relations with them but through respectful engagement. One can communicate with the lion and the lion with the human, as can all animals and all humans who make the effort to do so. However, as shamans are quick to tell us, our modern technologies that feature computer screens, cell phones, and television can interfere with this natural ability. Even the shaman who has acquired these skills may lose them by spending too much time engaged with these external devices.